As we drive down the road, Christian von Koenigsegg laughs. "A GM engineer said we'd never have an engine without a camshaft a few years ago. We were driving in a car without a camshaft at the time, so he must have been wrong." Welcome to the future. Within Koenigsegg there's a small company, a skunkworks, called Freevalve (just renamed from Cargine). What Freevalve makes is simply incredible. See, there's this thing in engines known as a camshaft. It has lobes that rotate, which then, in turn, open and close the valves on the engine as it rotates. It has been in the engine since the beginning of engines. What's good is that it works. What's bad is that a camshaft is very analog. What I mean is that the valves will never just be open or closed, there will always be an in between stage that isn't as efficient as it can be. An on/off switch for a cam shaft would be called a square cam profile, but there isn't really a way to do that. But engineers have gone with thinking that the camshaft is the only solution available. Why's that? Why not go a little coo coo bananas and think of something bonkers? The Freevalve engine gets rid of the camshaft and the throttle body, replacing it with pneumatic actuators on top of each cylinder. This is something that has also been toyed with for a long time with electromagnetic valve openers, some ships use them now. That means the concept is proven, but now it's about reducing that scale to something smaller and more usable than a huge ship. What that does is give completely independent control over each cylinder and each valve. If you have four valves, sometimes it only opens two. You can't do that with a regular camshaft, since the lobes are set to open all the valves. In order to get that sort of variability that Freevalve has, you'd have to totally switch cams. Freevalve can also shut down one cylinder, two cylinders, three cylinders, etc. It has that square cam profile that makes engineers all wet in the trousers. What else is amazing is that it can run in a number of modes. They can run it as a two stroke at lower revs, which effectively improves power delivery to make 3,000 RPM feel like 6,000. It can run the Miller Cycle, which sounds complicated but improves both power and efficiency. Mazda did it in the Millennia S. It can also run multiple fuels. Christian said it can run diesel or gas. You can't mix them together and expect it to work, but maybe two separate tanks depending on what you want to do. It's a fascinating idea. 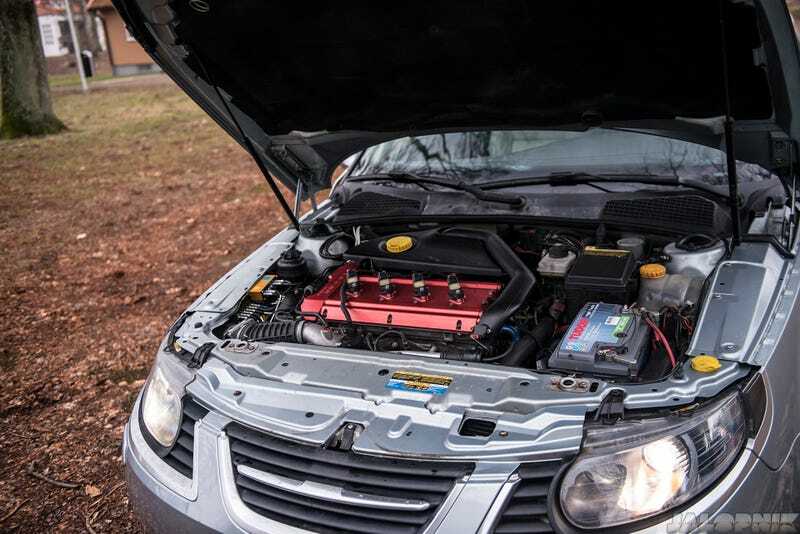 But here's the most impressive part: If applied to a current engine, it will provide 30 percent more power and torque, and up to 50 percent better economy. It's also lower and smaller than an engine with a camshaft. So, if built from scratch, a smaller displacement engine can have the power and efficiency to compete with larger engines. Christian described a camshaft as "playing a piano with a broom" while Freevalve is "playing a piano with your fingers. You get a much greater level of control." And since it's all independent, one cylinder or actuator can break and the engine can keep working for years. In a brief ride in the Saab 9-5 that Freevalve is using to develop the new power plant, what I can say is that it felt exactly like a car, which is truly a high compliment for any technology that claims to do what this does. At lower revs, the engine feels a bit diesely, but it smooths out as you go along. The tech works, what is still nascent is the engine mapping software. They need to perfect it, but they have time. This was also their Generation V technology, and Generation VI is on the horizon. Christian does not believe that this will keep the internal combustion engine from becoming obsolete, but he did say it will extend its life. But just imagine if this idea came to fruition a decade ago. Where would internal combustion be today?